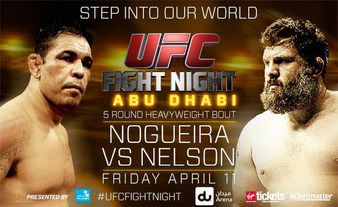 UFC Fight Night Abu Dhabi is this Friday (the prelims start a little before noon here on the East Coast), and though the main event features two aged veterans in Minotauro Nogueira and Roy Nelson, there's another pair of fighters with a ton of miles on them in the co-main event. That's right, I'm talking about Clay Guida and Tatsuya Kawajiri, whose combined records have them in the ring/cage 86 times. Yeah, that's a lot of fights, but it should still be a good bout (provided they don't run away from each other for 15 minutes). Anyway, to get you motivated to watch, here's Kawajiri crushing a past-his-prime Chris Brennan in PRIDE: Bushido. Enjoy!